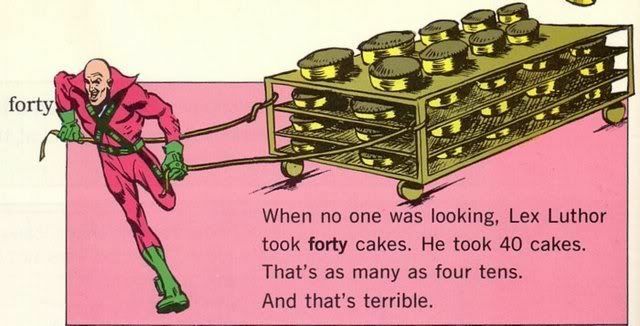 First, let me just say I’m really embarrassed to be just learning about the Lex Luthor cake situation. However, this article (while I get most of my newsy news from The Beat, Chris Sims at Comics Alliance is my favorite source for HILARIOUS, thoughtful stuff like this) on other entries in the Super Dictionary (don’t bother – I just snapped up the last copy on the internet under $100) brought up something I’ve been thinking about some lately. Really, though, doesn’t this make perfect sense? I mean, you spend your entire life studying and training to be a one-man anti-crime strike force, and you’re expected to sit around and listen to Maverick from Top Gun because he found a magic wishing ring in a cereal box? Get real. It’s amazing Batman even lets the rest of the Justice League finish their sentences. While I won’t remark on the intentions of whatever Samuel Johnson-esque wunderkind created this treasure chest, it is kind of true that Batman is a little bit of a jerk (see: either recent Batman movie, Miller’s Batman and Robin, like anything where Batman is even in the same room as the Green Lantern or Plastic Man [who sort of deserves it] or really anyone). I wholeheartedly agree with Sims though; the man has reached such heights of strategic mastery that why would anyone else even DARE to be in the same room with him? There’s a moment in Blackest Night #0 where Green Lantern flashes back to Batman making fun of him for rushing into things without a plan; while I don’t really think this is a reference to the Dictionary, it does bring me back to Identity Crisis, which I recently recommended for like the one millionth time. There’s a lot of heavy Batman stuff in that book, but the moment that stands out right now is when all the other DC heroes sort of stand back and let Batman boss them around. After watching both Superman Returns and Dark Knight this weekend, I’m just hung up on this idea that the DC universe has a real respect for strategic geniuses (coming full circle back to Lex Luthor here), and balances them against beings capable of these incredible feats of strength in a really compelling way. 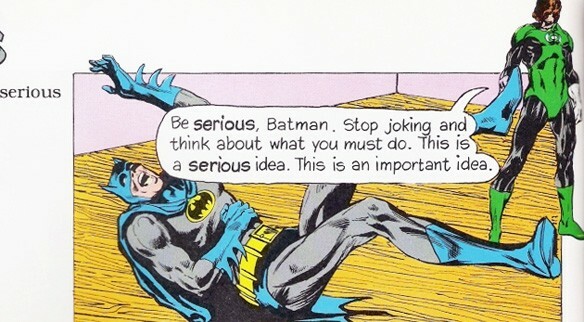 Also the fact that Batman is just unspeakably awesome.